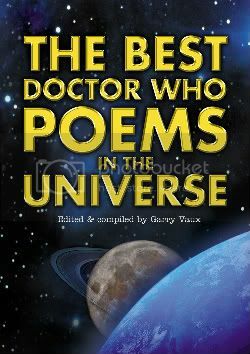 The Best Doctor Who Poems In The Universe is a new book to be released by GJB Publishing compiling a collection of poems and limericks from fans around the world. A wealth of subjects are covered, including the Doctor, the Master, Cybermen, Sarah Jane, Donna, K9, The Green Death, The Mara, Gallifrey, Delia Derbyshire, and Rose; plus, what it's like to be a Doctor Who fan! Poetry isn’t necessarily something you associate with Doctor Who but since new Who came back it’s had an extra emotional element to it and with it’s action hero, the heartbreak, the fun, the scares and the thrills, it seems like an ideal subject for poetry. The artwork is stunning and there are some wonderful poems from some very talented people. I hope it will encourage more wordsmiths and artists to put pen to paper. I’ve been a fan of Doctor Who since childhood and it’s the only programme these days I watch religiously so I’m delighted to produce something to celebrate it in a different kind of way. The book is available to buy from the publisher's website. There lies a special place. One survivor - who changes his face. But perished after four knocks. His name is heard throughout the universe. This mad man with a box. In the constellation of Kasterborous.